With Marc Jacobs staging the concluding show of the New York Fashion Week’s (NYFW) official calendar, the fashion circus has finally fled across the Atlantic to see the rest of the Spring/Summer 2018 shows in London, Milan and then Paris. Owing to the departure of four key designers (Altuzarra, Proenza Schouler, Rodarte and Thom Browne) who are planning to show in Paris this time, New York’s fashion prowl did get a bit dull but there is still enough talent in the city to keep the world on its toes. The location switch may be more about business and retail-friendliness than directionality. However, the season’s overall theme was all about using ‘America’ as the key reference point. On one side, designers are taking notions of the ‘American Dream’ and completely twisting it over its head, while others like Monse are taking comfort in the idea of an older, simpler time with pioneer style dressing clearly coming back in vogue. Another clear indication of this optimistic mood was the season’s hot pop colour story that danced between everything from bright yellow and tangy oranges to saturated marina blues. 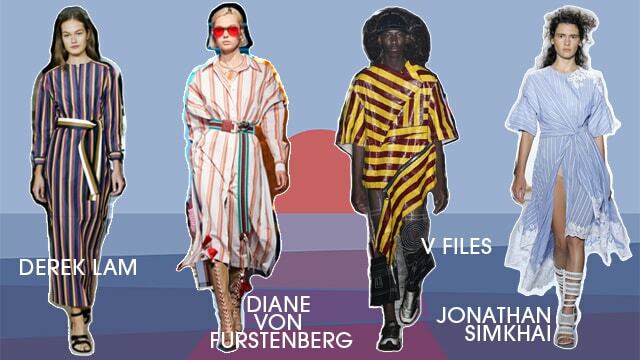 While we will be doing in an in-depth coverage of the season’s colour palette at the end of fashion month, here are the key trends for Spring/Summer 2018 from New York Fashion Week. Designers are undoubtedly renegotiating their personal histories and relationship with the country as a way to distinguish their work, while also throwing light on the going political upheaval at the same time. 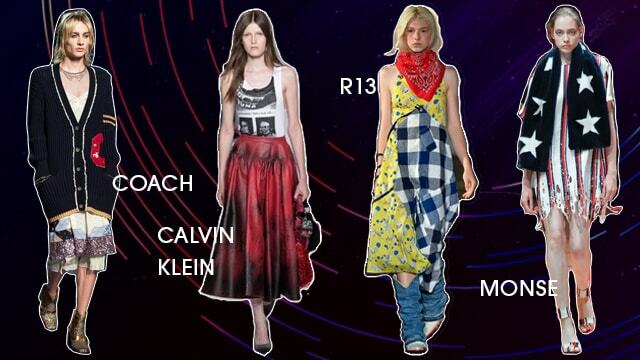 Calvin Klein’s homage to America took horror film plots on a high-fashion ride with wispy satin shirts, fifties style paint splattered full skirts in glove leather and eerie Warhol prints on everything from tanks to madcap dresses. Monse went into a celebration mode with varsity cardigans, sports jerseys and putting stars and stripes on almost everything. The last season’s millennial pink has distended far and beyond the realms of fashion. While pink still has some momentum left, it has transitioned into the new hue for Spring 2018 collections i.e. baby lilac and soft purples. Michael Kors made use of the shade’s serenity in floor-grazing skirts and palm print jackets and trousers; GCDS stuck to silk bomber jackets and Rosie Assoulin presented long, nonchalantly cut-out gowns in the colour. Statement sleeves have been going strong for at least a couple of seasons now and Spring/Summer 2018 will be no different. However, instead of the more seventies bell sleeve of last year, designers are really experimenting with poufy and oversized gigot sleeves this season. Spotted at Maryam Nassir Zadeh in monochrome mid-length dresses, at Carolina Herrera adorned with large paillettes and at Delpozo in honeycomb prints, this is a trend to watch. Stripes in the free-flowing silhouettes and candy cane colours are adding just the right amount of fun to silhouettes that are actually quite wearable. The lines, which are mostly vertical this season, are crafting a balanced dose of business with pleasure at designers like Diane Von Furstenberg and Derek Lam. Stripes were spotted on PVC fabrics at VFiles and in artfully cut and spliced cotton(s) at Jonathan Simkhai. The next phase of athleisure is already here and it is far more fashion forward than its elder cousin. 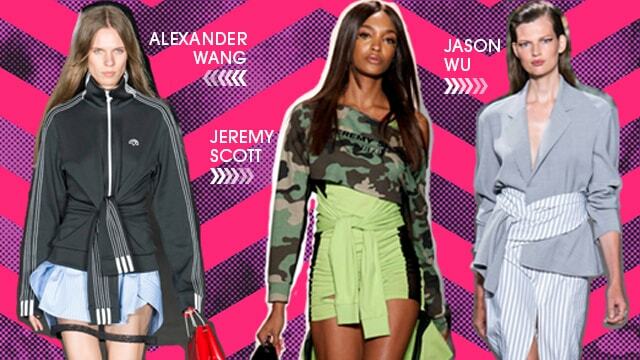 Designers are taking utilitarian sportswear looks and taking it out for a bourgeoisie glamour spin. Rihanna’s sportswear collaboration with Puma is perhaps the best embodiment of sport-glam. Her vaguely technical sportswear was dotted with cargo pants, swimsuits and nylon jackets. 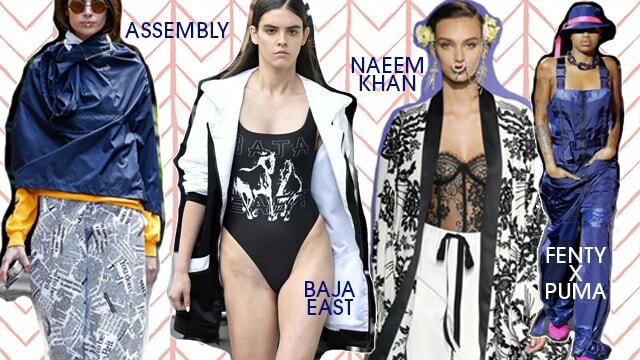 Apart from the pop star, luxury brands like Assembly, Naeem Khan and Baja East are keeping up with the trend as well. As contrasting rebuttals on gloom and polity keep going strong in global culture, so will the utilitarian detailing in fashion apparels. Taking a breather from sequins and all that jazz, the designers have kept jumpsuits very raw to its roots this season. 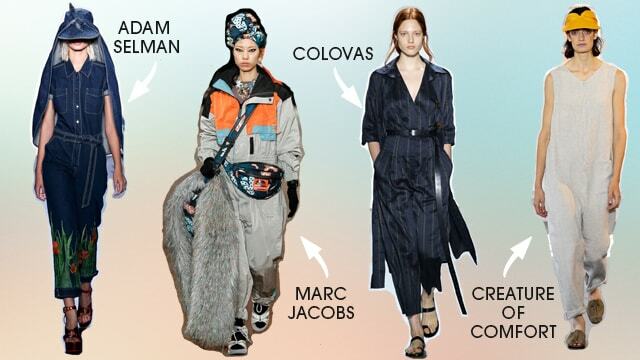 Creating separates that look like worker’s uniforms and racing style suits are brands and designers like Creatures of Comfort in super minimalist details, Colovos in business stripes and Adam Selman in clean dark denim. 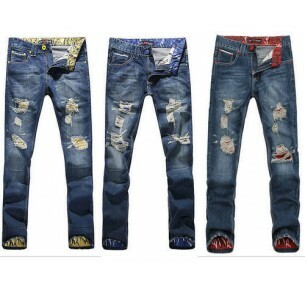 On one side, there are brands like Gucci and this season’s Gucci look-alike Coach 1941 who are going all out on maximalism; there are plenty of designers still keeping things clean and minimal. Celebrating all things feminine and beautiful, sheer and semi-transparent fabrics like gossamer-light georgettes, organza and chiffons are reigning strong. 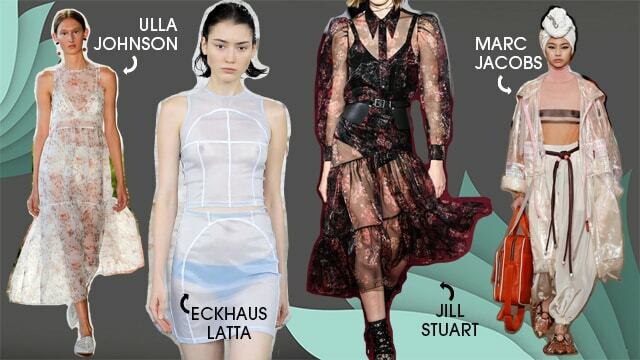 Eckhaus Latta showcased a collection that was almost completely see-through; Jill Stuart went for prairie girl florals in pioneer dresses and Marc Jacobs took the sporty bend with plastic-blend jackets. Hemlines of both dresses and skirts may be dropping lower and lower this season but shorts are staying in their pin code. However, the silhouette is becoming supremely ‘work-appropriate’ by pairing this young favourite with suit jackets and formal blazers. 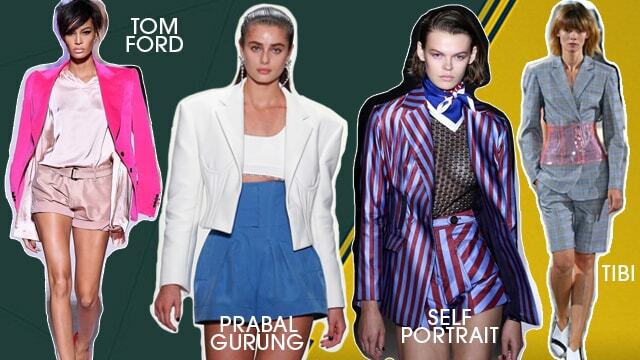 As seen on multiple runways like Prabal Gurung, Tom Ford, Self Portrait, and Tibi in combinations that go from matching separates to complete intermixes, this is definitely the silhouette to watch out for Spring/Summer 2018. Although daytime sequins might have petered out this season, there is enough summer twinkle still in place. Seen at Tom Ford’s popularly proclaimed ‘fabulous’ collection in almost everything from suit sets to hot pants, silk satins are very much luxurious shine of choice. Helmut Lang created structured bra tops and deconstructed skirts in the fabric, while Marchesa kept things commercial and pretty with ruffled gowns and off shoulder dresses. A perfect simile for fashion month inspirations, fabric manipulation basics like twisting, knotting and over-pulling are the season’s favourite draping trend. The classic trend of tying your shirt around the waist was the go-to nineties waist clincher and designers like Jason Wu, Alexander Wang and Jeremy Scott are making it more of a garment detail this season where there is no need for an extra layer because the knots come attached with the skirt or dress already.